Please click HERE to submit full paper. Please click HERE to pay conference fee with credit card. Please visit out new website HERE. 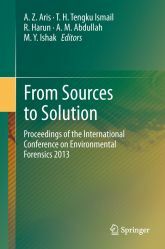 The conference invites submission of abstract in the following major disciplines of environmental forensics and other traditional areas in applied sciences. Contaminant Sources and Detection, Analytical chemistry, Geochemistry, Atmospheric chemistry, Earth sciences, Marine sciences, Emerging pollutants, Environmental Fate and Transport Assessment, Geology, Hydrogeology, Oceanography, Meteorology, Energy and climate change, New Approach and Applications, Pollution control technology, Pollution prevention and remediation, Environmental conservation, Environmental resource management, Governance and Management, Environmental-related policy, Environmental planning, Life cycle management, Legal considerations, Socio-economic Factors, Public awareness, Forensic education, Risk assessment.